After her violent and abusive husband defrauds the townsfolk of Whiskey Creek, Sophia DeBussi is left destitute and hiding out in her now empty house. Despised by most of her neighbors, she has few options and nobody she can turn to. Ted Dixon was betrayed by Sophia many years earlier. While he was away at college, she stepped out on him, became pregnant and married the boy who would become her abuser. He more than anyone has a right to resent Sophia but when he sees how she is being treated he reluctantly agrees to offer her a job as his cook and housekeeper. Sophia loves Ted, she always has, but she accepts that any chance she had with him disappeared years earlier. Now with her daughter being bullied at school, someone making threats against her, and those in authority unwilling to intervene, she just wants to make enough money to flee Whiskey Creek with her daughter and start over. Take me Home for Christmas is very good Contemporary Romance about a woman who has been beaten down so often that she has started to believe what her abuser and his parents said about her. As she works for Ted she slowly learns to value herself again and finds hope for a second chance. Loved this book. 5 Stars. 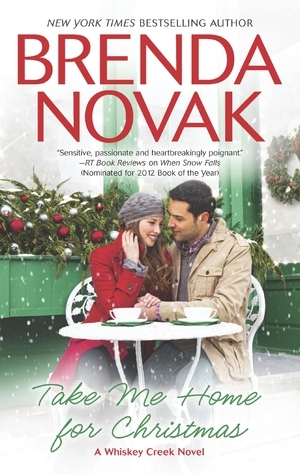 This entry was posted in Uncategorized and tagged brenda novak, Christmas novel, contemporary romance, Sophia DeBussi, Ted Dixon, whiskey creek by setaian. Bookmark the permalink.